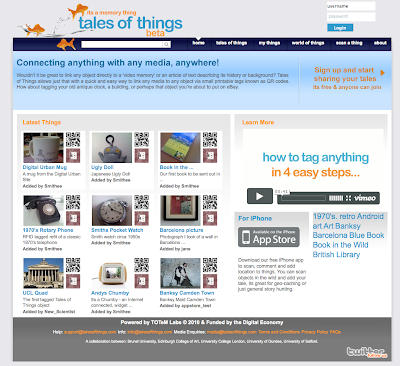 Tales of Things is part of a research project called TOTeM that will explore social memory in the emerging culture of the Internet of Things. Researchers from across the UK have provided this site as a platform for users to add stories to their own treasured objects and to connect to other people who share similar experiences. This will enable future generations to have a greater understanding of the object’s past and offers a new way of preserving social history. Content will depend on real people’s stories which can be geo-located through an on-line map of the world where participants can track their object even if they have passed it on. The object will also be able to update previous owners on its progress through a live Twitter feed which will be unique to each object entered into the system. The project will offer a new way for people to place more value on their own objects in an increasingly disposable economy. As more importance is placed on the objects that are already parts of people’s lives it is hoped that family or friends may find new uses for old objects and encourage people to think twice before throwing something away. The Tales of Things site is located within the emerging technical and cultural phenomenon known as ‘The Internet of Things’. The term is attributed to the Auto-ID research group at MIT in 1999, and was explored in depth by the International Telecommunication Union who published a report bearing the same name at the United Nations net summit in 2005. The term, ‘Internet of things’, refers to the technical and cultural shift that is anticipated as society moves towards a ubiquitous form of computing in which every device is ‘on’, and every device is connected in some way to the Internet. The specific reference to ‘things’ refers to the concept that every new object manufactured will also be able to part of this extended Internet, because they will have been tagged and indexed by the manufacturer during production. It is also envisaged that consumers will have the ability to ‘read’ the tags through the use of mobile ‘readers’ and use the information connected to the object, to inform their purchase, use and disposal of an object. The implications for the Internet of Things upon production and consumption are tremendous, and will transform the way in which people shop, store and share products. The analogue bar code that has for so long been a dumb encrypted reference to a shop’s inventory system, will be superseded by an open platform in which every object manufactured will be able to be tracked from cradle to grave, through manufacturer to distributor, to potentially every single person who comes into contact with it following its purchase. Further still, every object that comes close to another object, and is within range of a reader, could also be logged on a database and used to find correlations between owners and applications. In a world that has relied upon a linear chain of supply and demand between manufacturer and consumer via high street shop, the Internet of Things has the potential to transform how we will treat objects, care about their origin and use them to find other objects. If every new object is within reach of a reader, everything is searchable and findable, subsequently the shopping experience may never be the same, and the concept of throwing away objects may become a thing of the past as other people find new uses for old things. TOTeM is funded through a £1.39 million research grant from the Digital Economy Research Councils UK. The project is a collaboration between Brunel University, Edinburgh College of Art, University College London, University of Dundee and the University of Salford. almost 24 hours after the release, and no one has used it – which is not surprising since it does not seem to be possible to register. The my things page looks like it is asking for username and password to register, but then just sends you back to the same page when you put anything there. Thanks for the comment – registration is fixed from the page and its being used, actually its really interesting to see what it being tagged.